I am looking for a Carter’s JUST ONE YEAR No. 4461 light brown chenille bear with dark brown ears, nose, and feet. It has a blue gingham plaid bow around its neck, and it has an embroidered CARTER’S logo on front. There is a rattle in it. I have seen one on e-bay, but they were asking $32.95 plus shipping, which is more than I can pay. My six year old received this sweet bear with the green bow. She got it from my best friend as her first gift. About 6 months ago it went missing. We have looked everywhere. I thought she had finally let it go, but last night she mentioned him again and how much she misses him. It is heartbreaking. I don’t even know if I should tell her that I found it when I do, or tell her I am looking for a new one. I think it is who gave it to her that matters a lot too. same bear with yellow bow. around 10$. Ebay Item number: 280195324431. Could tell her it needed to change its bow. 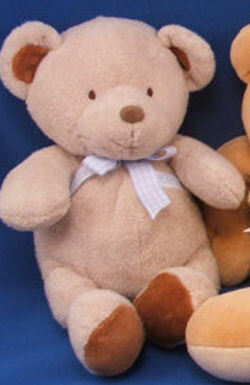 Need a bear similar with yellow gingham bow. Dog chewed it and child is heart broken. Thanks. Found one with a pink bow and replaced t with the old yellow one – ecstatic child. Thanks!